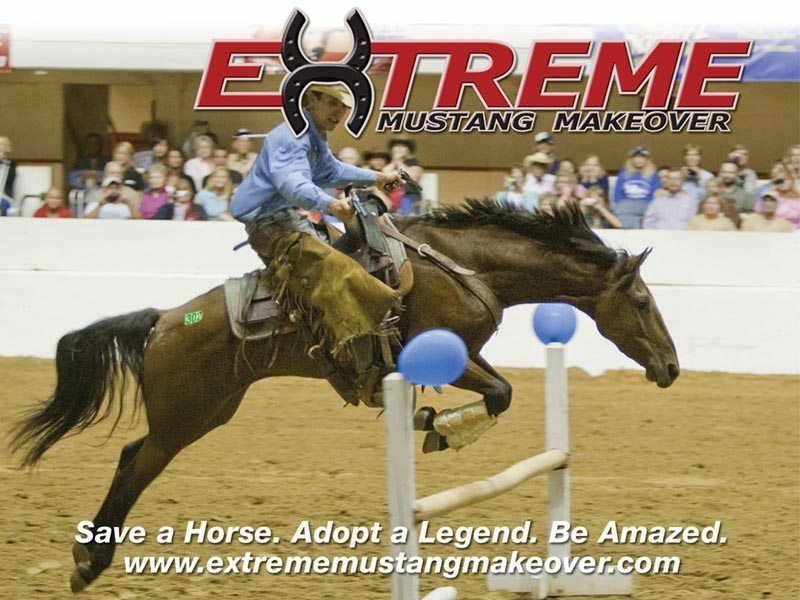 After a three year hiatus, the Extreme Mustang Makeover will make a return appearance at the Midwest Horse Fair® held April 20, 21, 22—2012 in Madison, WI. Trainers from across the country will pick up their wild mustangs at the end of January and will have approximately 80 days to gentle the wild horses in hopes of winning a share of $10,000 estimated purse at the Midwest Horse Fair® this April. The Mustangs competing in the Extreme Mustang Makeover challenge are mares that are virtually untouched until their January pick-up. Horses will be judged based on their body condition and their newly learned skills. Both horse and trainer will compete in a series of classes that include an in-hand obstacle course and a horse course where the horse and rider team must maneuver over obstacles. The top 10 from the preliminary rounds will have the chance to win the prize money during the freestyle finale on Sunday, April 22. All Mustangs competing in the Extreme Mustang Makeover will be available for adoption during an auction on Sunday following the finale. Adoption fees will be set by competitive bid. To qualify to adopt, individuals must be at least 18 with no record of animal abuse. In addition, adopters must have suitable facilities and can adopt no more than four animals. Adoption applications may be obtained and approved onsite by the Bureau of Land Management during the event. The purpose of the competition is to showcase the beauty, versatility and trainability of these rugged horses that roam freely on public lands throughout the West. The Bureau of Land Management (BLM) protects these iconic animals under federal law and periodically removes excess animals from the range to ensure herd health and protect rangeland resources. Thousands of the removed animals are then made available each year to the public for adoption. More than 3,300 wild horses have been adopted through Mustang Heritage Foundation events and programs since 2007. The mission of the Mustang Heritage Foundation and the goal of the Extreme Mustang Makeover events are to increase the adoption of Mustangs across the country. The Mustang Heritage Foundation created the Extreme Mustang Makeover events to showcase the recognized value of Mustangs through a national training competition. The Bureau of Land Management (BLM) is responsible for managing 258 million acres of public lands, located mostly in the West. Wild horses and burros roaming public rangelands are managed in a manner consistent with BLM’s overall multiple-use mission, as set forth in the Federal Land Policy and Management Act of 1976. For more information, visit www.wildhorseandburro.blm.gov or call 866-468-7826. The Extreme Mustang Makeovers are made possible through a partnership with the Bureau of Land Management and the generosity of their sponsors: Ram Trucks, Western Horseman, Pfizer, Vetericyn, Roper Apparel & Footwear, Gist Silversmiths, Martin Saddlery and Smith Brothers. The weekend of the Midwest Horse Fair®, April 20, 21 & 22—2012, will be full of events for all horse lovers. Visit the Midwest Horse Fair® website at www.MidwestHorseFair.com to stay up to date on all of the clinicians, competitions and shows that will make up the weekend. Tickets for the event are on sale now.